Children's book illustrator Stephanie Yue sold her belongings, gave up her apartment, and hit the open road—on a scooter. Here's her story. 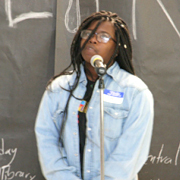 Librarian Abbe Klebanoff shares tips and suggestions for organizing a teen poetry slam event during National Poetry Month and beyond.